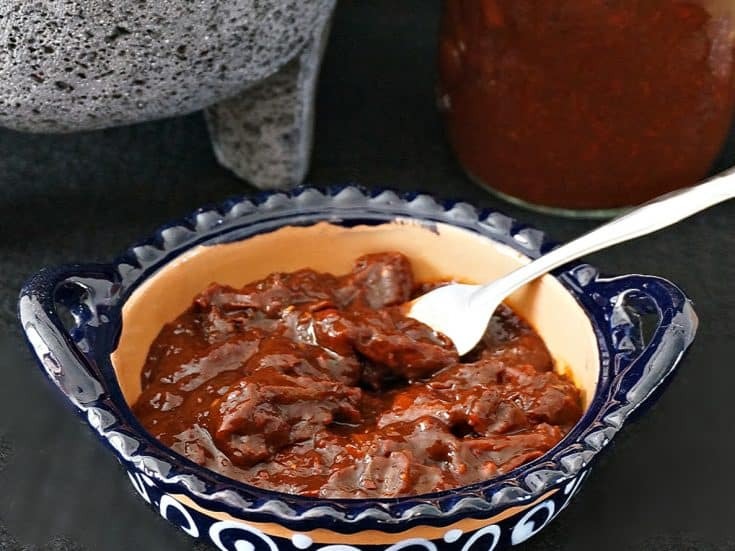 Chipotles in Adobo Sauce are a staple ingredient in Mexican cuisine. Chipotles, smoked and dried jalapeños, are paired with a thick intensely flavored Adobo sauce. The sauce features flavorful aromatic ingredients such as dried chiles, garlic, cinnamon and Mexican oregano. The spicy peppers are used to enhance classic dishes such as slow cooked Barbacoa Beef, and Red Enchilada Sauce. It can also be used or to give a little extra spice and flavor to dishes such as this Spicy Hummus with Chipotle in Adobo recipe or to make a tangy smoky spicy Barbecue Sauce. While they can be purchased in small cans sold in grocery stores international foods aisles, they are so much better when made from scratch. 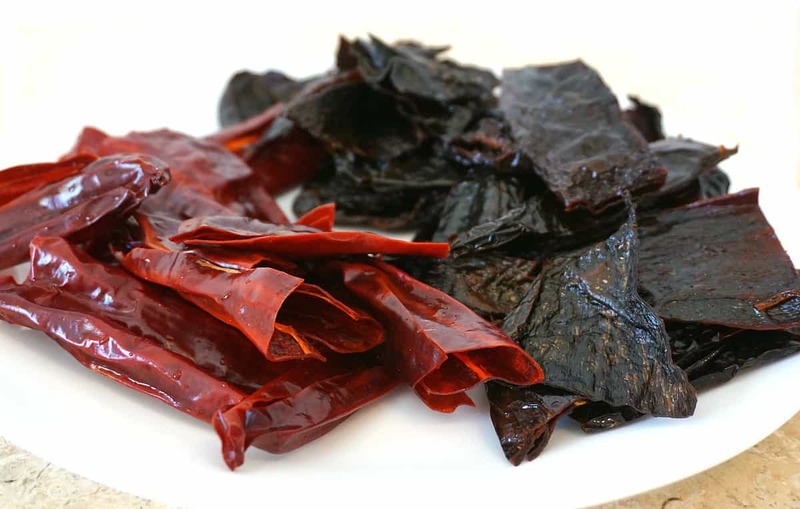 Cut the Ancho and Guajillo peppers lengthwise and remove the seeds and stems. Wash them to remove any dust and cut them into quarters. Cover the peppers with boiling water and allow them to rehydrate for 30 minutes. The peppers may float and can be weighted down with a plate or bowl. In the mean time wash the chipotle pepper, Cut them length remove their seeds and stems. Soak them similarly in boiling water for 30 minutes. Note: For extra spiciness leave the seeds intact and just remove the stems before soaking. Instructions follow for using a mortal and pestle, or utilizing a food processor or blender to make the sauce. 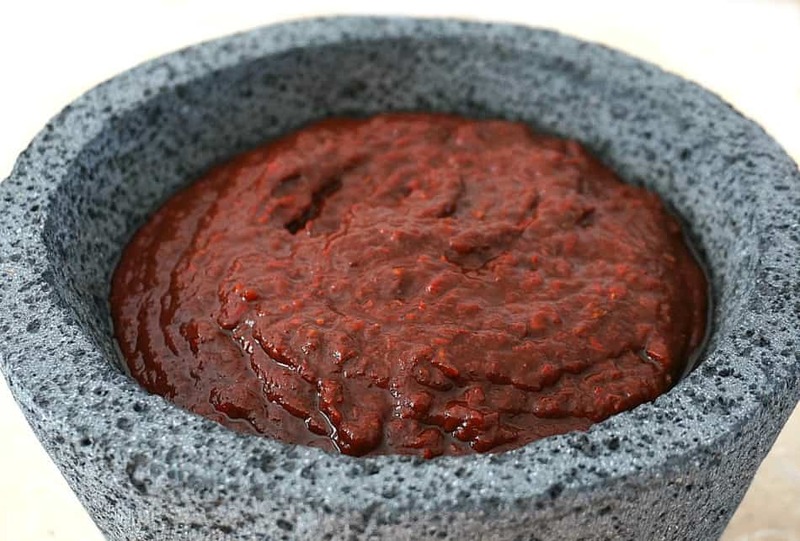 To make the Adobo Sauce, using a mortar and pestle (or the Mexican version pictured using a traditional molcajete), begin by grinding the dry spices. Then add the dried chiles, garlic and onion a little at a time and mash until a thick paste is formed. Transfer to a sauce pan and stir in the tomato paste, sugar and vinegar.. If using a blender or food processor, combine all of the ingredients except the chipotle peppers and blend until smooth. Add the mixture to a sauce pan. Add the chipotle peppers and stir. Bring the mixture to a boil then reduce to a simmer. 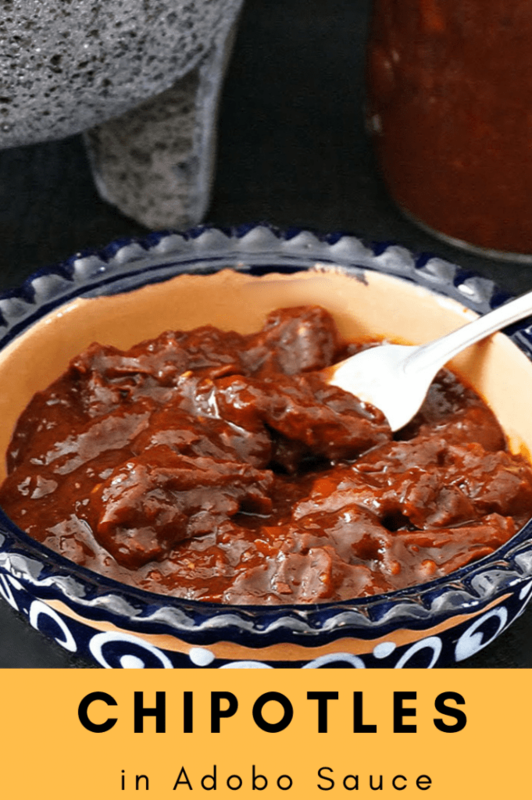 The mixture should be the a similar consistency to a thick barbecue sauce. Add water in small amounts to achieve and maintain the consistency of the sauce as the mixture cooks. Allow the mixture to simmer for 45 minutes. Taste and adjust seasoning. The mixture is meant to have a strong potent flavor and slightly sweet, but should not be bitter. If it is, add a teaspoon of sugar at a time and small amounts of salt until any bitterness is gone. 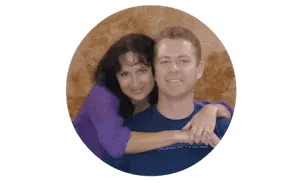 Allow to cool and then store in a sealed container in the refrigerator. For best results, allow the chipotle peppers to combine with the flavors of the adobo sauce for a day. It can be used for several months or can be frozen and thawed.